Trump Lambastes $1 Trillion F-35 Jet On Twitter : The Two-Way The president-elect called costs for the Lockheed Martin-helmed project "out of control" and implied he'd scale back such costs after taking office. 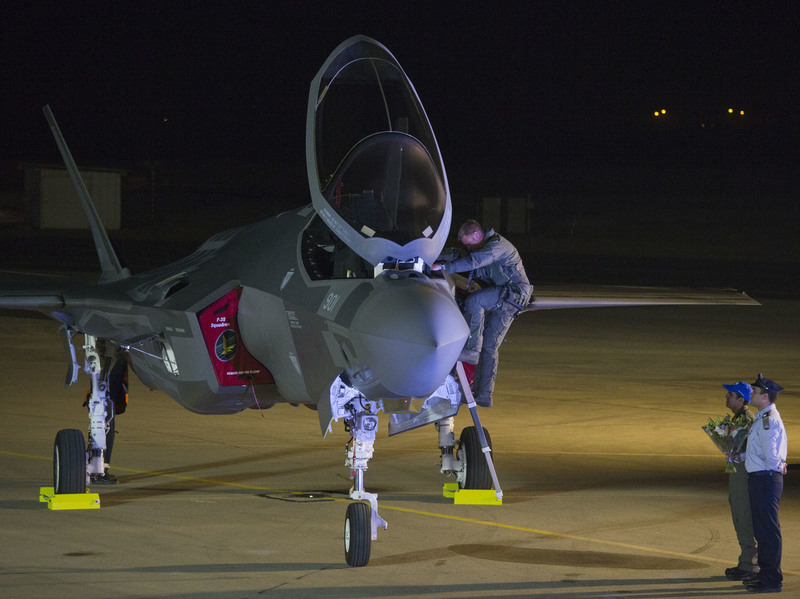 An F-35 fighter jet arrives in Israel, one of the U.S. allies to put in orders for the next-generation aircraft. President-elect Donald Trump tweeted the program's $1 trillion price tag is "out of control." Trump's tweet coincided with the delivery of two F-35 jets to Israel. As NPR's Daniel Estrin notes, Israel along with the United Kingdom, Italy and Japan are among U.S. allies who've put in orders for the fighter. On a visit to Israel Monday, the head of the project for Lockheed responded to Trump's criticism, saying he'd welcome the "opportunity to address" questions from the president-elect and noted plans to reduce the cost of the aircraft within the next four years. "We're investing hundreds of millions of dollars to reduce the cost of sustaining the airplane over its 30-40 year lifespan," said Lockheed's Jeff Babione in a statement. "We understand the importance of affordability and that's what the F-35 has been about." "Difficulties perfecting each individual model, however, as well as a risky choice to begin production of the aircraft even as they were being developed and tested, have caused many problems for the massive program. "The U.S. Air Force and Marine Corps have declared 'initial operational capability' for their small batches of F-35s, but the aircraft are limited in what they can actually do and have not deployed operationally. The U.S. Navy is still testing its model, which is built to take off and land on aircraft carriers at sea. Meanwhile foreign customers, dissuaded by the program's high costs and continued developmental issues, have scaled back their planned orders; Australia and Canada decided to buy batches of older-model aircraft from Lockheed's archrival, Boeing. "The U.S. Defense Department insists, however, that the F-35 is worth the nearly $1 trillion overall price tag and the extra time it has taken to put into service. Advocates point to its ability to evade detection by other aircraft or air defense systems, its revolutionary ability to see the battlefield and process information, and the value in the U.S. fielding the same type of aircraft as its closest allies, including the United Kingdom, Japan and Israel." Trump's F-35 takedown is the second time the president-elect has judged a aircraft budget as "out of control." Last week, he tweeted the same about a Boeing plan — calling out the manufacturer by name — to build two new 747 jets to be used as Air Force One, ending his tweet with "Cancel order!" As NPR's David Schaper reported, those jets would be the first new iterations of the president's plane since the early 1990s.